My last post on April 26, “Why I’m Worried,” I went through several fundamental and technical indicators that showed the first quarters rally was likely to have ended. 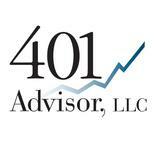 From an investment perspective our client accounts were moved to low beta stocks and ETF’s. I sold JNK. 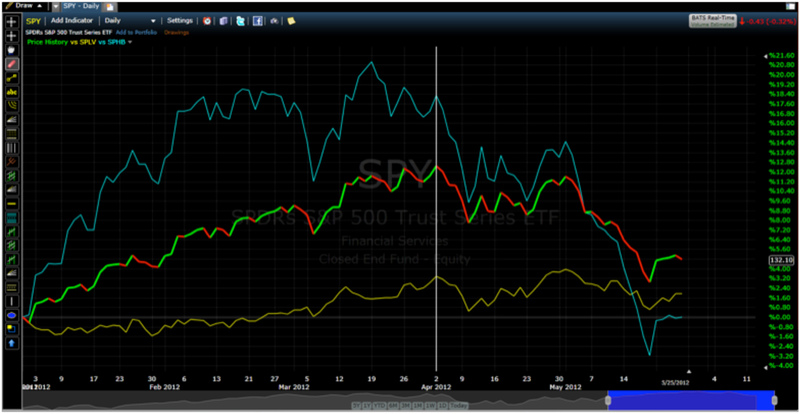 And last week added another defensive layer by adding SH, Powershares Inverse S&P 500 ETF to our income portfolios. Here’s a wrap up of why I am growing more bearish. Corporate Earnings. First quarter earnings came in very strong relative to expectations. That should have been a good sign, but it failed to move the market upwards. 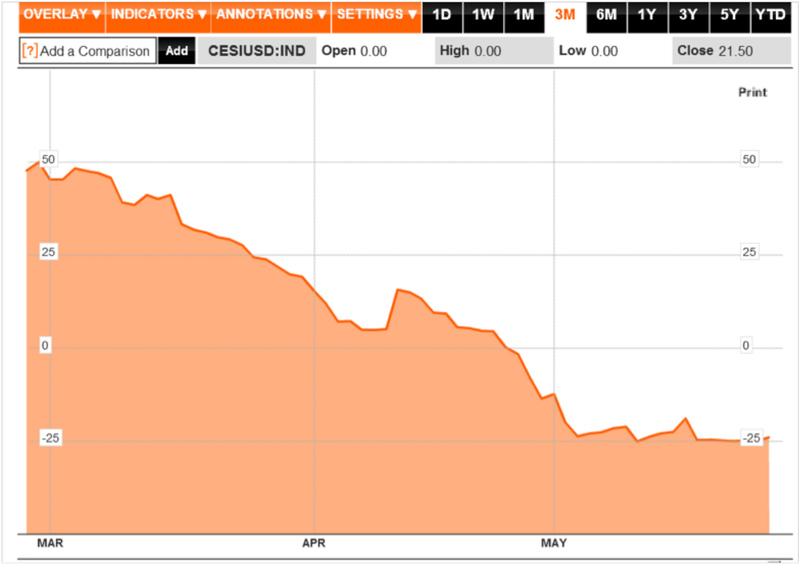 Citibank Economic Surprise Index (Figure1.) The stock market is based on expectations more than reality. As the chart in Figure 1. indicates actual economic data has been coming in below expectations. The index has flattened recently, but this could be from lowered expectations, as estimates have been missing for the past 3 months. 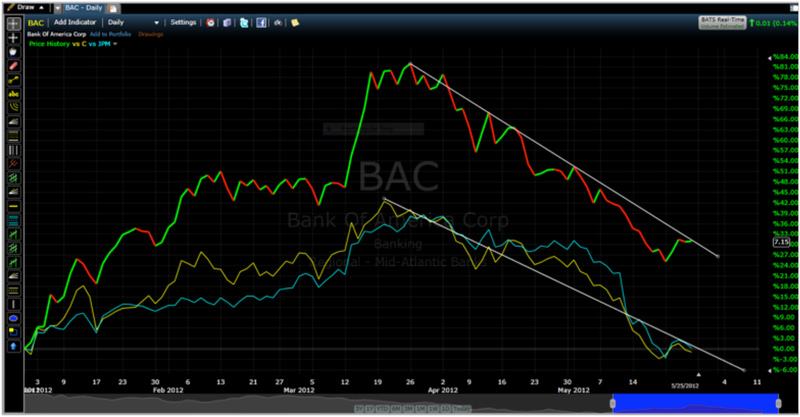 Look for a trend reversal as one signal that the market may have bottomed. Figure 1. Citibank Economic Expectations Index. 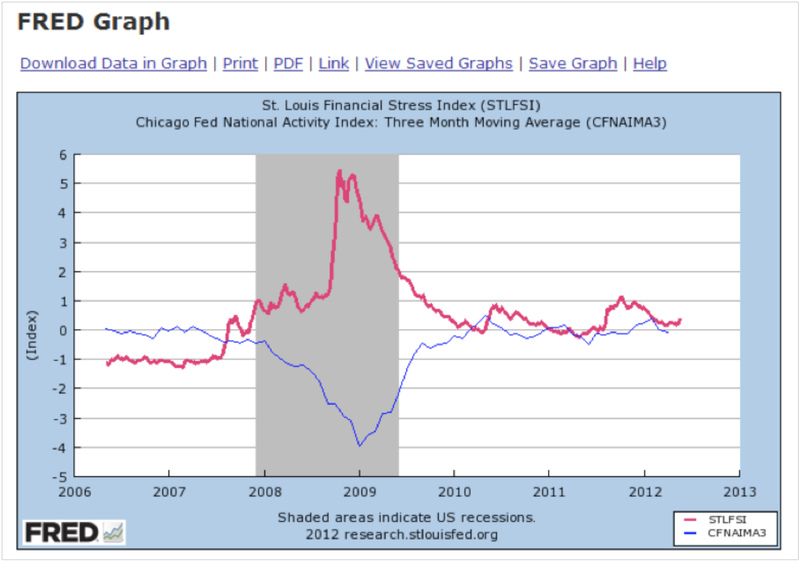 St. Louis Fed Financial Conditions Index and Chicago Fed Manufacturing Index. Last time I looked the CFNAI-3MA (3 month moving average) was weekly trending up and the STLFSI was trending down, but still at troubling levels. These indices have continued to weaken as seen in Figure 2. My comment a month ago was that financial conditions were not at levels to support strong economic activity. As seen below financial stress has turned back up (bad) in the latest reading. Expect CFNAI to continue to trend lower with its next release. Figure 2. STLFSI and CFNAI-3MA. Yield Curve Figures 4. And 5. The yield curve has been a fairly decent economic indicator. Reliable enough that the Federal Reserve has a formula that predicts GDP growth based on the spread between 10 yr and 3 month Treasuries. Figure 4 shows that the yield curve has been flattening as long term rates are declining. The current yield curve is the black line; the fading lines show recent history. 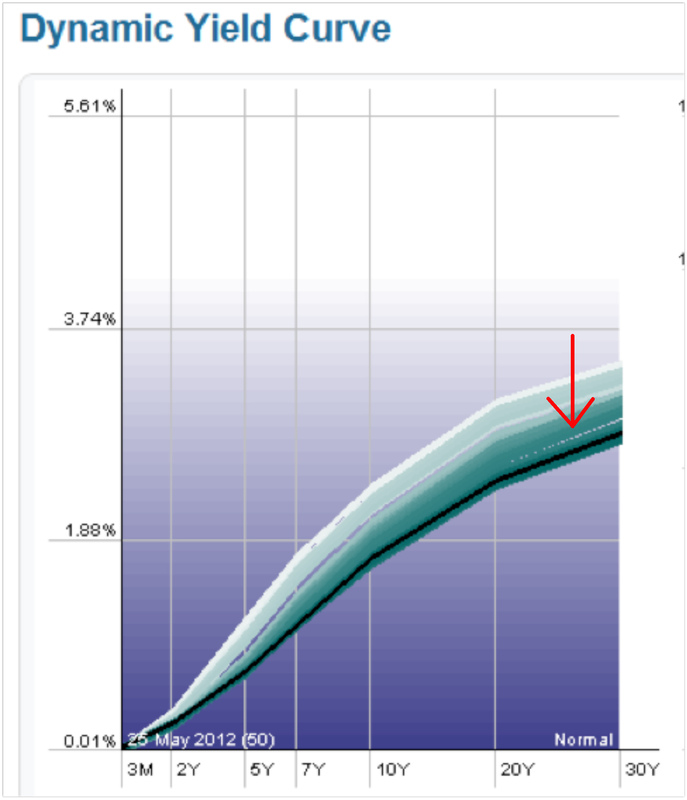 Figure 5 shows that at current rates the Fed is anticipating real GDP growth of around 0.7%. Not impressive, but still positive. Continue watching the long end of the yield curve. As rates come down the expectation for GDP growth will be lowered too. 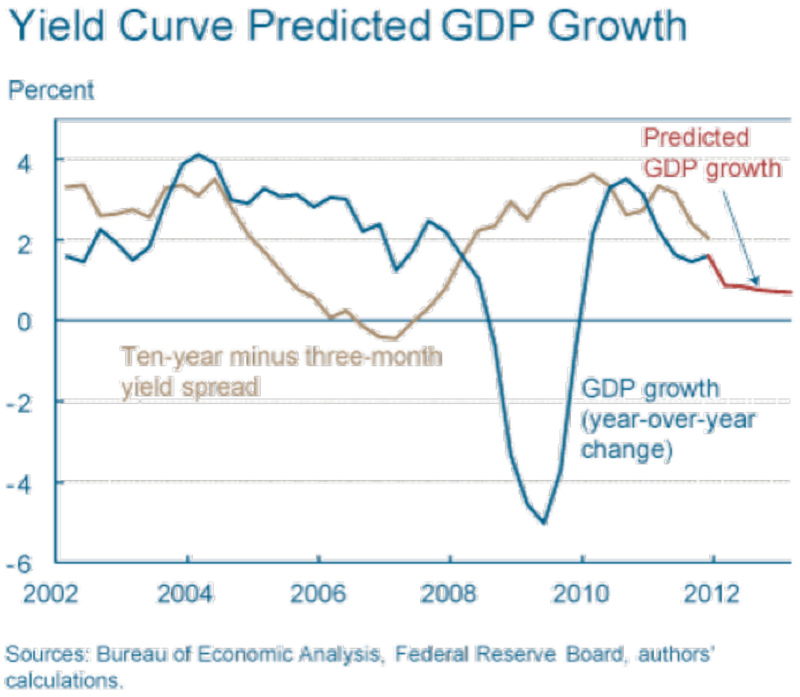 Figure 4 Future GDP Growth as Predicted by the Yield Curve. Europe. This is a topic worthy of a book. Actually I’m sure, dozens of books over the next decade or so. But the real issue, is what affect will, whatever happens, have on the U.S.? For a clue, take a look at the recent performance of our “too big to fail” banks; JPMorgan (JPM), Citi Group (C), and Bank of America (BAC). Simply put, these stocks have tanked since mid March. Yes interest rates have come down which will hurt earnings, but not enough to see 40% drops in price. Investors are definitely seeing problems ahead. While my understanding is that they are not directly exposed to European sovereign debt, they are exposed through the CDS market – as re-insurers of sovereign debt. Continuing Divergence Between SPLV and SBHB. The Stand and Poors High Beta (SPHB) and Low Volatility (SPLV) Indices shows a continuing flight away from the higher beta “risk on” stocks in the S&P 500. Since the stock market high in early April the low volatility index has continued to hold its own, while the S&P 500 (SPY) and the High Beta Index have continued to decline. 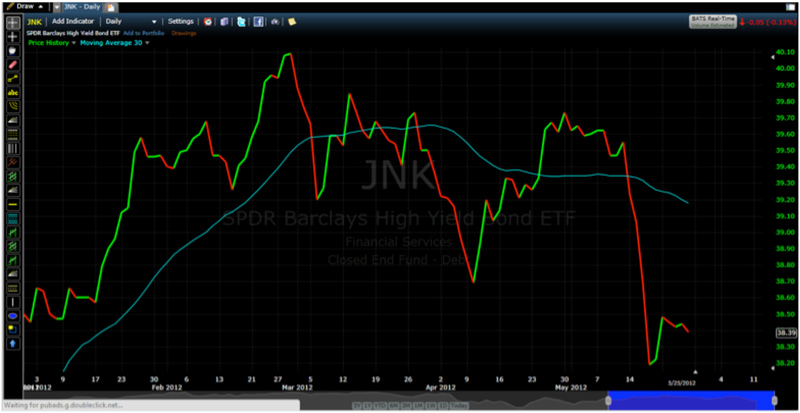 JNK Below 30 day Moving Average. A month ago I sold JNK (Spider High Yield Bond Index ETF), shortly after it broke down through its 30 day moving average. Since then JNK has continued to tumble. What makes this interesting is that if expectations are that U.S. corporations can weather a Euro storm, JNK would not be dropping off as it has the last 30 days or so. Clearly, the markets are indicating that there is a serious worry that whatever happens in Europe, will have a negative impact on both our economy and corporate earnings. No indicator is 100% certain in predicting either the economy or the stock market. As an investment advisor I’m entrusted with clients’ business and personal wealth. It is incumbent upon me to adjust our holdings as the market indicates either softening or recovery. It is about probabilities, not certainties. What we’re seeing now, across a fairly broad spectrum of indicators, is that investors are worried. There are more sellers than buyers of risk assets. Period. The questions are, “Is this a time to be a contrarian?” My personal opinion is that if Greece exits the Euro there is a strong likelihood of another 40% drop or more in our markets. The next question then is not “whether” this will happen, it is “what are the consequences if it does?” Are you and your clients willing to live through another sell off? If not, the only prudent response is to take risk off the table and take a wait and see approach. If these reports are terrific, then we may spring higher. Unfortunately, if the economic reports show weakness, and then coupled with the debt problems in Europe, the markets could resume their spring sell off and extend into summer. Watch the economic indicators listed above for a turn around. If corporate earnings and GDP can continue to grow in the face of European turmoil we could be setting up for the end of this 12 year old secular bear market. It is just looking more likely that we will have to go lower first, before we see a return to a long term secular bull market.